I love our gym (A LOT) but there's just one thing missing... Spin classes! When I lived up in Seattle I got addicted to spin classes. For me, it's the best workout. I've been looking to add spin back into my workout and have been hearing a lot about BurnCycle. 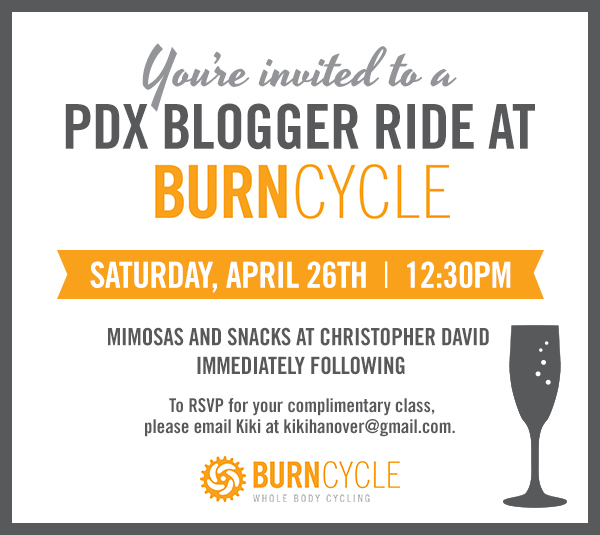 I've been wanting to try out a BurnCycle class for a while, so when I came across a PDX blogger event that includes a complimentary class - I signed right up! I'm not sure if there are any spots left, but if you're interested send an e-mail to the address on the invite! Portland blogger friends - are you going to this!?! I'm pretty excited!! I'll be there too! See you on Saturday!